UM motorcycles became a centre of attraction by launching a set of dynamic motorcycles at EICMA 2017. 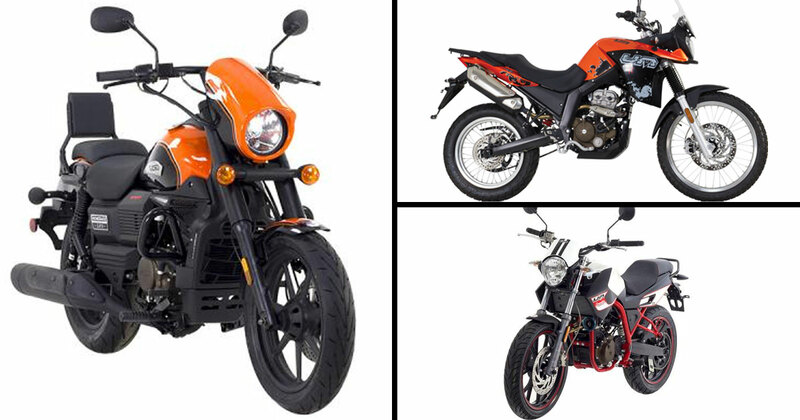 The oldies of Renegade family including the Renegade Commando, the US Renegade Commando Classic, Commando Mojave, and Renegade Sports S have also attended the show with a fresh 125cc engine. The newbies' list is also there to appraise the attendees. Below is the detailing about the neophytes. The Renegade Scrambler X is a new model from the offering list of UM. There were two motorcycles based on the same platform which unwrapped at EICMA 2017. It is an enduro kind of bike which obtains spoke wheels with gold rims, bar-end mirrors, off-road tyres, high set front mudguard, stomp grips mounted on a fuel tank, and two pannier containers. To lighten your way, it has a LED headlamp and a tuned exhaust to fill the proposal list. The Renegade Scrambler X has got the long travel USD forks and monoshock at the rear end. At the event, the bike was presented with a 125cc engine but we can expect a tweak in its engine to be 300cc engine later on if UM launches it to India. The Renegade Vegas Sports S follows the trails of the Renegade Sports S. The bike is showcased with a 125cc engine at the Show but we can expect a 300cc engine if the company plans to launch it to India. Considering the reference model Sports S, the bike is modified with a single-seat-design and a seat cowl at the rear. The bike appears somewhat orange and black color scheme which is reflecting the highlights with orange color on the black painted parts of the bike. The round LED headlamps of the bike looks distinctively good on it. The front forks are made in a combination of rubber gaiters to resemble some old memories. The dimensions of the new bike are peeking out about the Sports S with eliminated brakes, the suspension, and alloy wheels. UM also presented an electric cruiser concept at EICMA 2017 in the range of new offerings. Although, UM kept the spec of the bike a secret and didn’t reveal it. Cafe Renegade, which is inspired by the Scrambler, is the other offering by UM motorcycles to pop-out the latest offering list. The Cafe Renegade is equipped with a rear seat cowl, alloy wheels, rim tape, a small bikini headlamp fairing, and black & white livery. The lookouts of the bike have similarities with Ducati’s Scrambler range and we can take this as a UM Scrambler range. The UM Adventure TT looks same like an on/off-road bike which is powered by a single-cylinder, liquid-cooled, FI, 125cc engine. The design of the bike showers the glance of BMW F 650. The bike has an analog-digital instrument cluster, an aluminum rack at the rear, half fairing, an upright windscreen, high-positioned and large handlebar. The on/off-road tyres placed on what looks like a 19-inch front spoke wheel and a 17-inch rear spoke wheel. For better trail riding experience, it has a long-travel front and rear suspension along with a high exhaust setup. We can expect UM adventure TT to be equipped with a 300cc engine if the Bike appears to India. UM established a camp in India in cooperation with Lohia Auto in 2014. The plant has been started in Uttarakhand which produces the 300cc Renegade lineup within the country. The company will be manufacturing more bikes in this range and also planning to export them offshore. So we can expect the new generation bikes by UM to be 300cc instead of a 125cc liquid cooled engine as it will be more cost-friendly for UM rather than setting up individual tools for a fresh engine pertaining to the kit and features of the bike. For India, a 300 cc bike will be more relevant and reasonable choice to UM. In case if the bike to be manufactured in India they will be powered by 279.5cc single-cylinder engine which will be able to churn out a maximum torque of 25.15 PS and a maximum torque of 23 Nm. The engine will be mated to a 6-speed gearbox. During the EICMA 2017 show and launch of Renegade Classic, CEO of UM had mentioned that India will get three new bikes including one Scrambler, one Adventure bike and one cafe racer at Auto Expo 2018. So, now Indians are familiar enough with new gatherings in 2018 from UM motorcycles.